Make a number of chains for each section of their beams using a warping mill or board. The Warping Square is new to me, and I have actually not used one of those, but I have modified the third one and actually beamed sections directly from a warping mill, and it worked fairly well, although I found it time consuming, more so than option 1 with the tension box and spool rack. 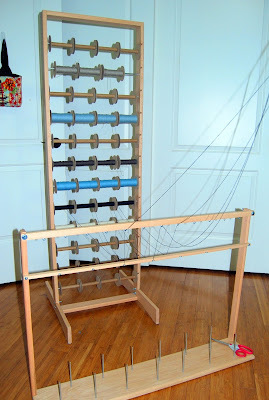 When I first began weaving, my first loom (a Schacht 8-harness table loom) came with a warping board and a plain beam. So, the only question for me was whether to warp front-to-back or back-to-front, not whether to warp with a plain beam or a sectional beam. The second loom was a Leclerc Artisat 36" 4-shaft floor loom with a plain beam. 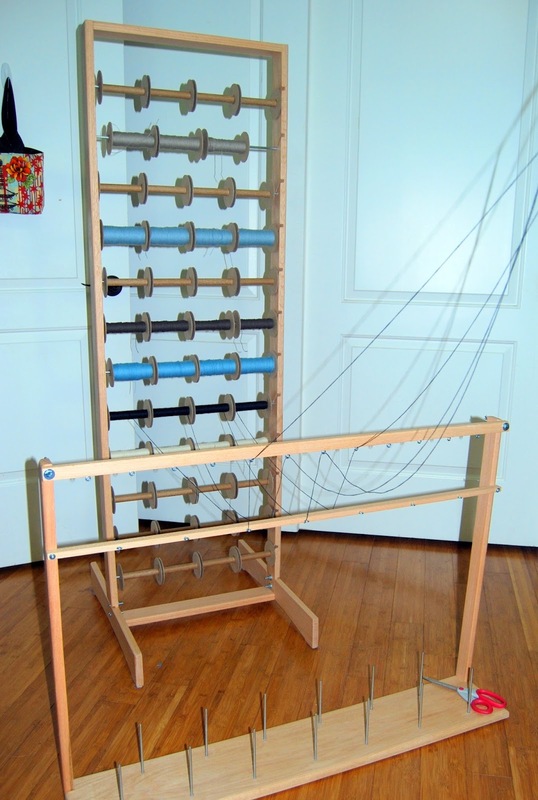 The third loom was a Macomber 54" with 4-shafts (but could hold up to 10 shafts and currently has 8) and a plain beam. 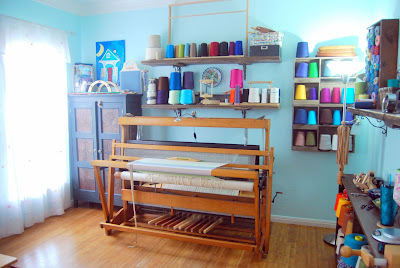 The fourth loom was a Leclerc Nilus 36" 4-shaft with a sectional beam! Thus, it was not until the Nilus came into my life, back in April of this year, that a sectional beam was even an option. No warp packing is required between the layers of thread (i.e., no paper is rolled between the layers of thread). There is more waste involved. If the sett of the project is 20, then 20 threads are needed to warp a 1-inch sectional beam, as 20 threads need to be pulled at one time. Those 20 threads need to come from 20 separate packages or 20 separate threads need to be wound onto spools in adequate lengths to cover the whole project. When I wind spools, I add a few more yards to each spool, knowing this will probably end up as waste. While I find threading the heddles and sleying the reed to be meditative, beaming the warp is my least favorite part of weaving. Preparing 14 yards on a warping mill does not bother me, but winding that much yardage onto the back beam, even with excellent and friendly help, is no fun. It is tedious. For projects more than 10 yards, sectional warping is my preferred method. For projects 10 yards or less, I am "okay" with plain beam warping. Thus, I ultimately decided to set my Macomber up with a second sectional beam, rather than converting it completely over to a sectional beam. Yes, I could have warped the sectional beam plainly, but the cost difference between swapping out the plain beam with a sectional one was negligible, then I would have had an extra beam lying around. I decided to go ahead and spend the extra money on a 1-yard sectional beam as a second beam, which would also allow me to do double weave, in the event I ever caught that wild hair. All that to say, I now have all the equipment to warp both ways, and last night ended up mutating the two to prepare a warp on the mill for some plain tea towels. 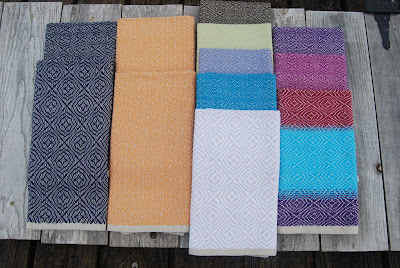 These towels use four different colors and each of the colors appear in the warp in multiples of four. so, I calculated that to speed up the warp prep, I could divide the total number of yards for each color by four, pull from four different spools and cut the total prep time to 25%! 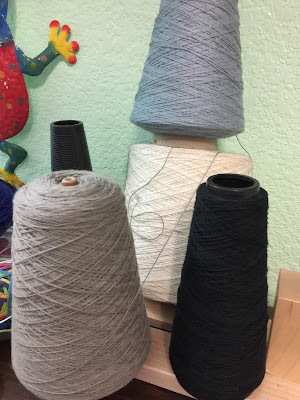 Because I have a spool winder and not a cone winder, I wound the thread onto spools with the intention of using the cone holder to pull the threads through onto the warping mill; however, that did not work because the lip of the spools was too wide. What I did learn though, is that winding onto the spools not only ensured I had enough thread to complete the project, but also gave me a good idea of the condition of the thread. My original color scheme was white, black, grey, and blue. 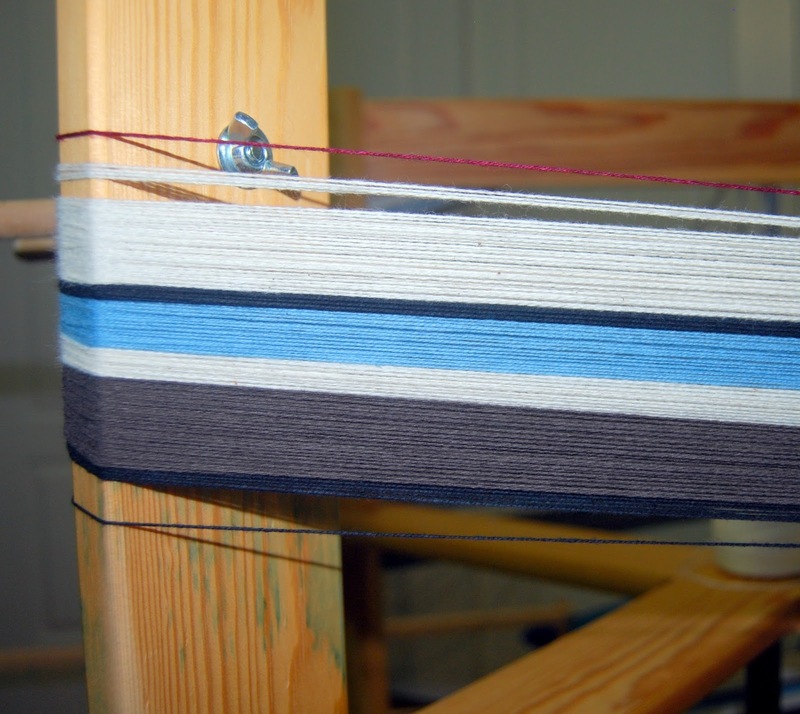 The first blue did not have enough for the warp, much less the warp and the weft. It is now relegated to weft usage for another project. No problem, it will not go to waste. The grey was just purchased from R&M Yarns. It was a mess. I needed 440 yards for each of 4 spools. Not one of the spools had fewer than 4 atrocious knots in it. I was aghast! Especially, as NONE of my other cones had any knots. The other cones came from Webs and R&M. I normally do not have issues with R&M at all, so I consider this an anomaly. I am just so grateful I caught it early, BEFORE I got to the warping mill, or I would really have had a mess on my hands. 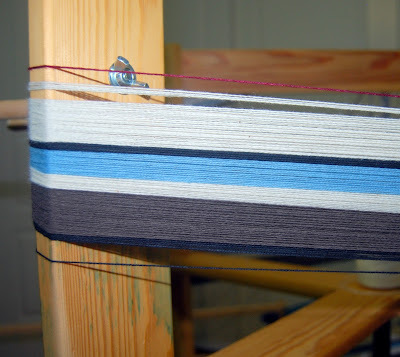 I can still use the yarn for weft, but it will not be used for any warp. In the end, I substituted a brown for the grey. It will work, although the contrast between the brown and the black is not as high as it was between the black and the grey. The cardboard spools came from Halcyon Yarns. I anticipate using them this way more in the future, if only to test the thread for defects.